As a critic, I play a lot of games. Like, a lot. I see many of the same things over and over and over again—the same ideas, the same mechanics, the same tricks. Of course that’s not to say a game has to be unique to be good, but it takes more than a quirky art style or slight twist to catch my attention. So, when I come across a title that not only delivers several new ideas but also nails them, I sit up and pay attention. Sega’s 7th Dragon III: Code VFD made me sit up and pay attention. Although I wouldn’t call it a strict dungeon crawler since it’s got too much story and too varied a world for such pat classification, 7th Dragon has much in common with the genre. Like many of its contemporaries, players are able to create their own party, customizing both appearance and class. Once a group of three has been composed, some story kicks things off and gets the player into dungeons where there’s a heavy focus on turn-based, menu-driven combat. However, the focus isn’t on the frequency of random encounters, but in how the skills of the characters work and play off of each other. Creating this sort of complexity is a difficult thing and few dungeon crawlers get it right, but Sega not only has it dialed in, they add dimensions I’ve never seen. 7th Dragon offers eight and a half (yes, a half) different classes, and each one feels fresh and different. Take the Samurai, for example. He or she may seem like a standard sword-user, but the class is able to choose between single or dual-wield, and can also shift between sheathed and unsheathed stances. The God Hand is another interesting class, focusing on hand-to-hand attacks while also being a healer. Players can choose to focus on either side of their personality, or mix it up as they see fit. Every type of character has some innovative interpretation, and I loved exploring the practical applications. Added to the mix are a great number of skills that are passive or automatic. Every character has at least a few, and they become huge advantages if invested in. Characters will launch free attacks before enemies can act, spent magic points will be regained in the middle of a battle, dead characters will be brought back to life, and so on—there are a slew of effects, each with their own trigger. Besides being highly functional, they give battles a bit of a “slot machine” feeling—a free action is never guaranteed, so when one pops up it’s like winning a small jackpot. 7th Dragon III also offers a new take on team structure. While only three party members will be initially available, the team soon grows to six, and then nine—three on the front line and six in reserve. The inactive members build up readiness at different rates, and some (or all!) may be called to assist in a pinch. Summoning one will break through a monster’s defense, three will activate a series of buffs, and tagging all six is a super-attack where every member fires off a power for no cost. It’s amazing, and adds a nice, chewy layer to extended battles. While all of these factors create some of the best turn-based combat design I’ve seen in quite some time, the developers also looked at the more mundane functions and made sure that those were perfectly polished as well—amenities like clearly highlighting the stats of armor and weapons and making it a snap to equip them, enabling fast travel nearly anywhere in the game, clearly marking important items and characters on the map, keeping a quest log with step-by-step instructions on what to do next, and a dozen other quality-of-life choices that make 7th Dragon III a totally hassle-free experience. The only place where the game misses a trick is that some cut-scenes before bosses aren’t skippable, but since the bosses are fairly infrequent it’s not hard to forgive this hiccup in lieu of what it gets right. In terms of aesthetics, the game is top notch. 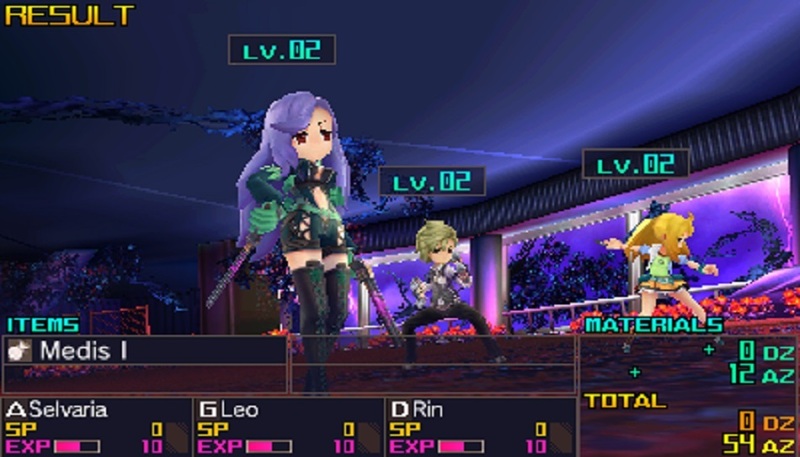 Unlike many titles in the dungeon crawler genre, 7th Dragon III understands the importance of seeing action onscreen. Where others skimp, this game splurges. Weapon choices are reflected on the character models, each attack and skill has a different animation, and monsters have fluid, exaggerated personality. The art style is also totally on-point, and with a soundtrack by Yuzo Koshiro, there’s nothing to complain about in regard to the audio. It’s all fantastic. If 7th Dragon III has a weak point, it might be that the story isn’t anything to write home about. I’m not saying that it’s bad, but it contains many familiar themes and most of the plot points probably won’t surprise players who’ve spent time with JRPGs. I’m also a bit curious about how much of the previous installments in the series (never released in America) influence the current story. It was easily understandable and welcoming, but there were a few times when I felt like I might be missing out on something that would have resonated with more context. Disclosures: This game is developed by Sega and published by Sega. It is currently available on 3DS and this copy of the game was obtained via publisher and reviewed on the original 3DS. Approximately 30 hours of play were devoted to the single-player mode, and the game was not completed at the time of review. There are no multiplayer modes. Parents: According to the ESRB, this game is rated T and contains: fantasy violence, language, mild blood, and suggestive themes. Honestly, this game struck me as totally harmless. I’m struggling to think of an example that might warrant a warning and I’m coming up dry. The action is bloodless combat with characters whacking monsters and… that’s about it. I’d say it’s totally safe. Deaf & Hard of Hearing: All dialogue is delivered via text and there are no auditory cues needed for gameplay. It’s fully accessible. Remappable Controls: No, this game’s controls are not remappable. It uses the circle slider, the face buttons, and the lower touchscreen is also required. So excited to get my hands on this game. I’ve been following the franchise since the early days on the original DS, and champing at the bit to finally play an entry in English. The demo left nothing to be desired, and I have no doubt that the full version is every bit the treat that you say it is.